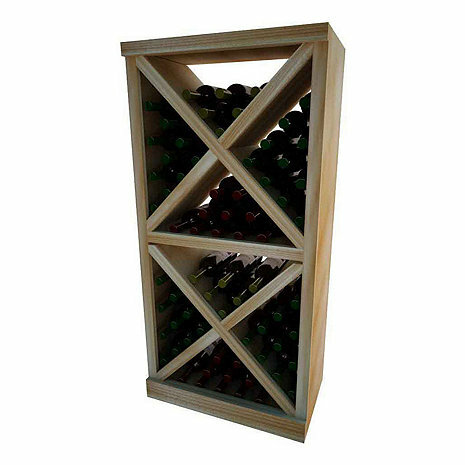 The Vintner Series Solid Diamond Cube Wine Rack organizes wine bottles in an attractive, popular, and practical style. The decorative face trim adds to the sturdy appearance and is a finishing detail only previously offered on our top of the line custom racking. The Diamond Cube Face Trim needs to be cut to fit on site. Purchase two to stack on top of each other to maximize the height of your wine storage. Assembly required. Solid Diamond Cubes organize wine bottles in an attractive, popular, and practical style. Each Vintner Series Solid Diamond Cube wine rack can hold up to 78 standard sized wine bottles. The decorative face trim adds to the sturdy appearance and is a finishing detail only previously offered on our top of the line custom racking. The Diamond Cube Face Trim needs to be cut to fit on site. Purchase two to stack on top of each other to maximize the height of your wine storage. Moldings and platforms sold separately. Vintage displays?do you help design? BEST ANSWER: Here are Wine Enthusiast, we have a team of sales specialists that can help you custom design your wine cellar. Please contact our sales department at 800.356.8466 and they can assist you with this. Thank you.